Los Angeles, CA – (June 2012): Say the word “Bohemian” and most people automatically think bell-bottoms and fringed vests. Today’s Bohemian look is refined, feminine and carefree, epitomized by fashionicon Nicole Richie’s modern Bohemian look. 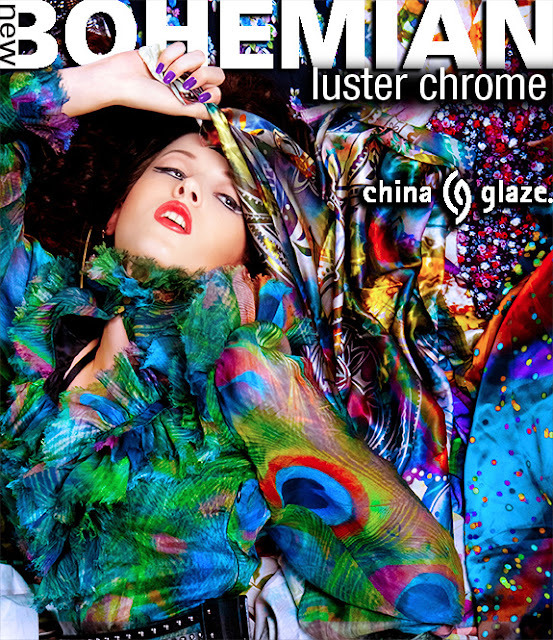 China Glaze® gives the free-spiritedlook a fresh, trendy spin with its latest specialty collection, New Bohemian. 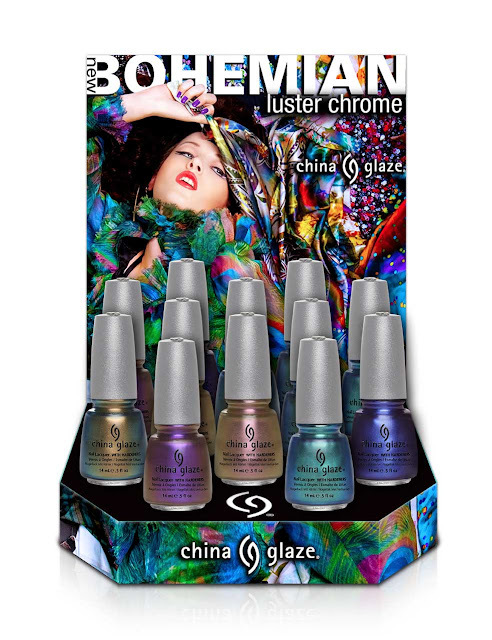 China Glaze® New Bohemian will leave you mesmerized as the color shifts and moves across the nail,traveling with the light. The chrome-like finish radiates with high shine and intense color, captivating your senses with every twist and turn. TheChina Glaze® New Bohemian collection will be available at fine salons and beauty supply stores nationwide in August 2012. Individual polishes retail for $6.99 MSRP. ChinaGlaze is free of DBP, toluene, and added formaldehyde. China Glaze naillacquers are available through salons and professional beauty supply storesnationwide. 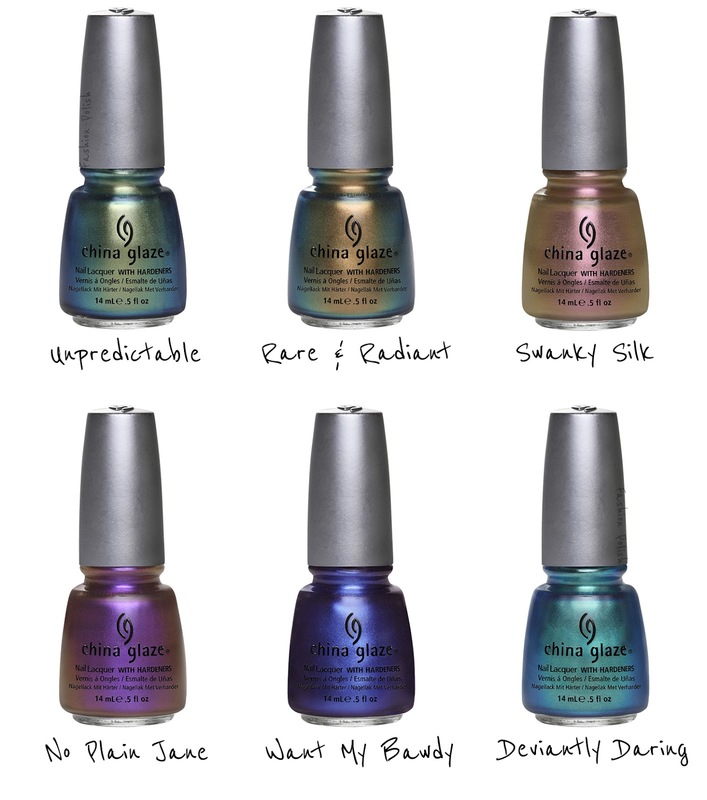 For more information, visit: www.chinaglaze.com or follow China Glazeon Facebook (@ChinaGlaze), Twitter (@ChinaGlazeOfficial) and Pinterest (www.pinterest.com/ChinaGlaze). China Glaze is a division of American International Industries. Fornearly 40 years, AII has been the leading manufacturer and worldwidedistributor of innovative, quality beauty and skin care products for men andwomen. Our product lines include Ardell, Andrea, Body Drench, Bye ByeBlemish, Checi, China Glaze, Clean + Easy, Clubman/Pinaud, Duo, EuropeanSecrets, EzFlow, Fright Night, Gena, GiGi, Gypsy Lash, IBD, Jeris-Lustray, NailTek, No Tweeze/Micro Tweeze, 'N Rage, Prolinc, RAW, Seche, SuperNail,Surgi-Care, Waterworks, Winning Nails, Woltra, Woody’s, and Youthair.For more information, visit our website: www.aiibeauty.com. Oh, man! I had heard they would be available 7/15. I'm super psyched about this collection... the waiting continues! Can't wait to see (and buy)Unpredictable, Swanky Silk, Want My Bawdy. oh, i love this collection! can't wait to see the swatches! Oh wow, just oh wow. They seem very interesting, I'm curious to see them in the nails.